This piece came together with Andy's Stamp sets and DecoArt Media paints and mediums. I started by applying DecoArt Media tinting base to the main substrate and when dry applied DecoArt Extender Medium to the whole canvas. Whilst still wet I applied DecoArt Premium Acrylics in Titanium White, Medium Grey Value 3 and Carbon black with a flat brush. This was then blended with a mop brush to create an ethereal feel to the background. and set aside to dry. Next up I created the pumpkins by applying air dry clay to some Tando Creative grey board circles and sculpting the shape. Once dry these were given a coat of DecoArt Media Fluid Acrylic. Once dry, DecoArt Media Antiquing cream in black was applied and wiped back. The Crow from Andy's Birds and Bones Stamp set was then stamped and fussy cut and set aside. 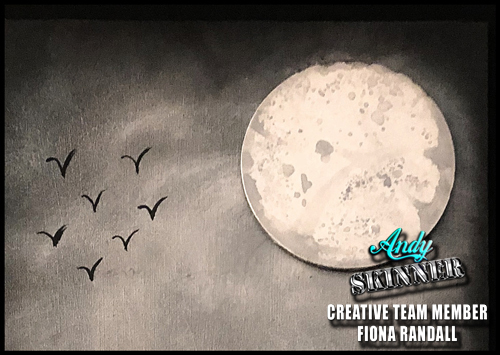 Time to create the moon which was a Tando Creative grey board circle which was given a coat of DecoArt Media Tinting base. Watering Can Archival Ink was then applied to an acrylic stamping block, spritzed with water and applied to the Grey board circle to create the effect of moon craters and dried with a heat too. 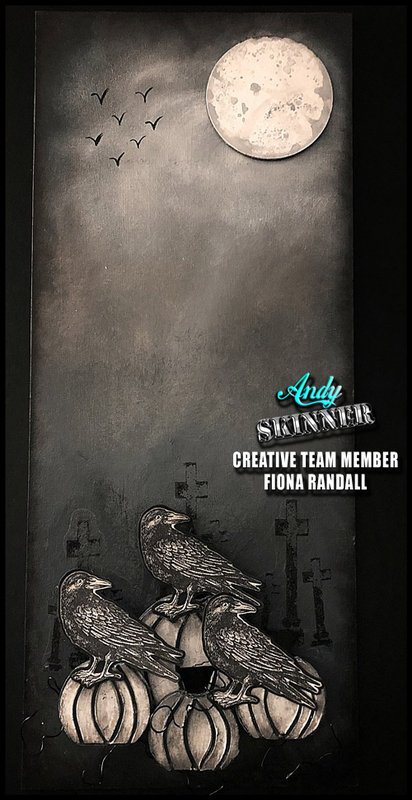 Some stamping of gravestones was then applied to the canvas base using Andy's Illusionary Artists Gothic Grunge Stamp Set. All elements were then applied to the canvas base To finish birds in flight were painted on the canvas and black wire curled around the pumpkins to form the roots. Andy Skinner Birds and Bones Stamp Set. 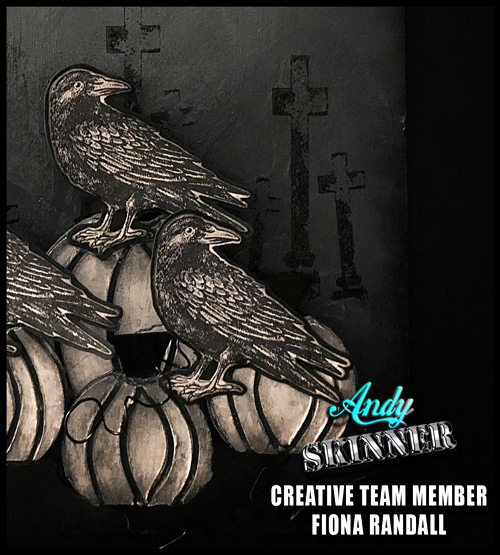 Andy Skinner Gothic Grunge Stamp Set. DecoArt Media Antiquing Cream- Carbon Black. Grab Bag of Grey Board Circles.